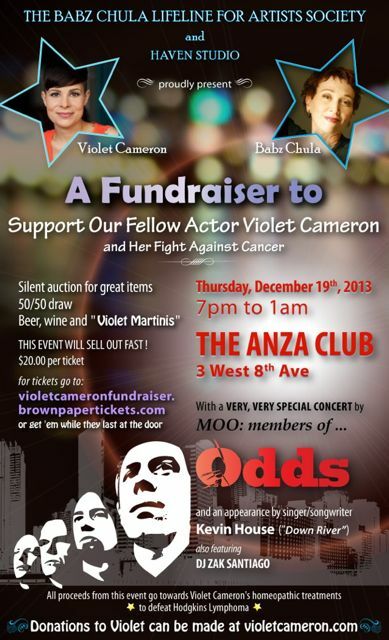 Haven Studio and Babz Chula have organized a fundraiser party for actor and dear friend Violet Cameron. Despite having had cancer twice and having undergone months on end of brutal treatments, Violet Cameron has remained positive and grateful for every moment. Her words have inspired Ben Ratner‘s students in Vancouver, Toronto, Montreal, and Winnipeg. Loretta’s students at Haven Studio have also been deeply touched and inspired by Violet’s bravery. She made many people remember how lucky they are to be able to do what they want to do, and showed them what true tenacity looks like. Violet wants to live, act and inspire others, but she needs our help to have a chance. Please GET TICKETS IN ADVANCE. This party will sell out fast — it’s a small venue with a great musical line-up. This entry was posted in Ben Ratner, Haven Studio and tagged acting, actor, actress, auction, Babz Chula, Ben Ratner, cancer, December, donations, Down River, encouragement, event, fight, grateful, Haven Studio, inspiration, Kevin House, Lesley Diana, Lifeline for Artists Society, love, Montreal, party, positive, PR, press, singer, songwriter, support, The Anza Club, The Promotion People, tickets, Toronto, Vancouver, Violet Cameron, Winnipeg on December 9, 2013 by press.